Yesterday, I wrote Why It Matters: BookCon. Click through to read the entire post. "On May 1st at 1pm (EST), there will be a public call for action that will spread over 3 days. 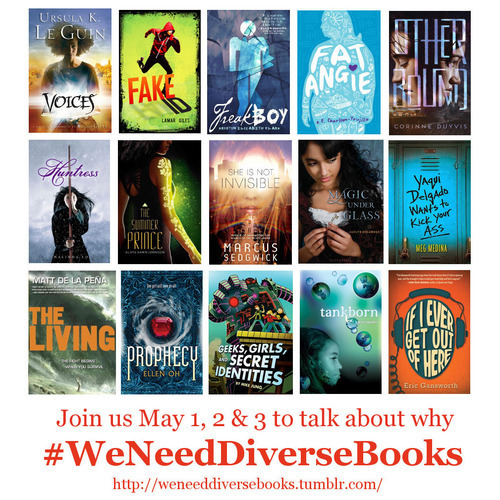 We’re starting with a visual social media campaign using the hashtag #WeNeedDiverseBooks. . . . We want people to tweet, Tumblr, Instagram, Facebook, blog, and post anywhere they can to help make the hashtag go viral. For the visual part of the campaign: Take a photo holding a sign that says “We need diverse books because ___________________________.”" I am trying to decide what my sign will say. "On May 2nd, the second part of our campaign will roll out with a Twitter chat scheduled for 2pm (EST) using the same hashtag." (I'll be at work, so I'll be taking a super late lunch to participate from 2 to 2:30). "On May 3rd, 2pm (EST), the third portion of our campaign will begin. There will be a Diversify Your Shelves initiative to encourage people to put their money where their mouth is and buy diverse books and take photos of them." My approach to diverse books is, needless to say, formed by who I am (white, cisgender, late 40s, female) and what I do (librarian, reader, reviewer.) I know I need to listen. But, I also need to know when, and how, to speak up. So, here's part of my reality. I don't think readers should be shamed or shoulded into reading books they don't want to read. For me, the prime reason a reader reads is because they want to read that book. The reasons for that want vary. How do diverse books figure into this? Including diverse books in the suggestions and recommendations that meet that "want." Because, frankly, I am over the belief some people hold that diverse books will always be "other" and not meet their "want." That belief? It's not shaming or shoulding to point out how troubling that belief is; and to do so in a constructive way by saying, here are the books that meet your reading needs. Part of that belief springs from something I wrote about yesterday: the myth that white is the default that everyone can identify with, but that the opposite is not true. That someone who is white cannot identify with a main character who is not white. Which is bull. And it's a belief that needs to be countered, loudly, and fought, loudly. And that is why I find this campaign exciting. Because diverse books are something we need to keep on talking about and to keep on promoting, and this campaign can be part of what brings about needed changes. As someone who likes to try and read a bit of everything I am behind this campaign. Not because of race or anything like that but because I believe that the more diverse one's book shelf is the more they gain from reading, the more their mind is expanded, different view points can be explored.